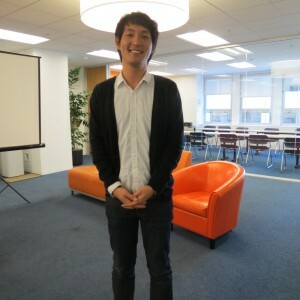 Oh Cheol Kwon, one of our awesome student ambassadors, spent his last day at EC San Francisco today. We’re sad to see him go and hope that he’ll be back to visit us soon. Thanks for all the hard work you’ve put in, Oh Cheol! Check out what he had to say about last Friday’s activity, a tour of the famous Mission Murals! “Drew’s Mission Murals Tour” was one of the enjoyable activities at EC. It was not first time that I participated in school tour activity since I started studying at ECSF. The main reason I joined in this special activity is that I wanna see something different, modern and not being in museum. Of course, got to know toward other students as well because I don’t know much about pieces of paintings based on some histrorical events. I saw many student’s name than I’d expected on the activity list and I found myself they might have the same feeling as mine. After having talked with some students, then it was true. For me, this activity was all about exploring some kind of hidden Murals, which was painted on the wall, garage, even some place in which it is not used to be. Teacher Drew took care of us on the tour and prepared for us and knew all about Mission area where he’s one of favorite spots as well as one of tourist attractions. As you all know, the more information we know, the more fun we can have. While we are on the way to some other murals, we dropped by at coffee shop that serves spicy coffee and tried its special flavor coffee. Have you tried “spicy coffee” before? I’ve never tried the coffee in any place else. That was so awesome and special. One of my favorite Murals around Mission area was totally about the entire painted building for women, which was our last destination on the tour. While we were walking down the street quite a long time, a lot of people looked little tired. However, when we saw the whole graffiti painted building and kind of make some sound “awesome” and pushed the camera-button continuously to get its nice-angled pictures. According to Drew’s words, each room in the building had its only purpose for women, bathroom, dress room, dinning room etc. We focused on that beautiful building without noticing the sun went down already. Thank you for letting me back to korea with an unforgetable memory. I had a great time with teacher Drew and all the students.